The traditional leader Nissan Leaf has become the first EV to hit 15.000 annual sales in Europe, adding up to over 33.000 cumulative sales for the model. However, the Renault Zoe has outsold the Leaf in each of the last three months of the year with over 5.000 sales in the last quarter alone. The Zoe has become the second electric car to sell over 10.000 units in Europe in a single year and since demand is no longer limited to customers who don’t mind renting the battery separately, there may be a new best selling EV in 2015. The Tesla Model S continues its impressive performance, selling almost 9.000 cars to a cumulative total of 12.747 European sales in 17 months of sales. Not bad at all for a high-price level car from an American start-up company. Indicating the lack of popularity of US cars in Europe, he Model S was the continent’s second-best selling American car in 2015, behind the Jeep Grand Cherokee. Volkswagen has successfully introduced the e-Up! and e-Golf, with a combined sales tally of 8.778 units, in just a few months of sales. These two will move up the charts some more in 2015. 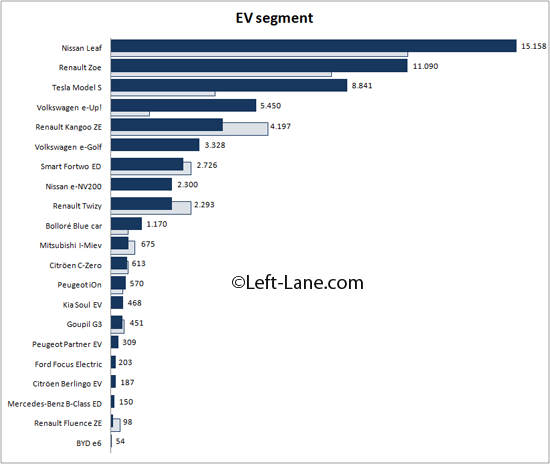 The Leaf’s MPV sibling Nissan e-NV200 isn’t doing all that bad itself, with 2.300 sales, almost all in Q4, when it was the third-best selling electric car in the segment, just ahead of the Model S.
A new competitor to the BMW i3 without the optional range extender is the Mercedes-Benz B-Class Electric Drive, which has arrived with a modest 150 sales. It would be nice if I can find split figures for the i3 with and without range extender, so we can compare these two models directly. At the bottom of the list we find the BYD e6, a Chinese zero emission MPV that’s sold primarily to taxi companies, with 20 in use in London since early 2014 and another 34 in Brussels in the last quarter. The London EV-taxi fleet will be expanded in 2015 and talks between BYD and a taxi operator in Barcelona are in advanced stages as well, so the e6 may move up the chart a bit further this year. The PHEV segment is still dominated by the Mitsubishi Outlander with more than half of all sales in the segment and a PHEV-ratio of almost 60%, by far the highest of all models that offer buyers a choice between ICE-only and plug-in versions. But the fastest growing brand in this segment is BMW, with the i3 moving into second place and the i8 into fourth position, outselling a number of cars at a much lower price point. And considering sales of BMW’s i-models is limited by production constraints rather than demand, it’s safe to say the Munich brand has hit bullseye with its environmentally conscious cars. Look for the Volkswagen Golf GTE and its clone Audi e-Tron to move up the charts in 2015 and pass their rivals Opel Ampera and Toyota Prius Plug-In thanks to the marketing power and dealer network of the Volkswagen Group.